How Long Do Injectable Lip Fillers Last? Which Lip Filler Is Right for You? Lip fillers are used to improve the volume and shape of the lips. The results tend to last for approximately six to 12 months. There are a number of FDA-approved options on the market, each with their pros and cons. Lip enhancement is a cosmetic procedure that can help you achieve fuller, more shapely lips. One of the most common types of lip augmentation are lip fillers, which typically use a dermal filler such as hyaluronic acid to temporarily add volume to the lips. A substance found naturally occurring in the human body, hyaluronic acid has replaced collagen as the filler of choice as it’s safer and longer lasting. Lip fillers are used to add volume, enhance the shape of the lips and reduce the appearance of fine lines. They have become increasingly popular in recent years due to their effectiveness and excellent safety profile. Injection: They are all delivered via a minimally-invasive procedure that typically takes 15-30 minutes. 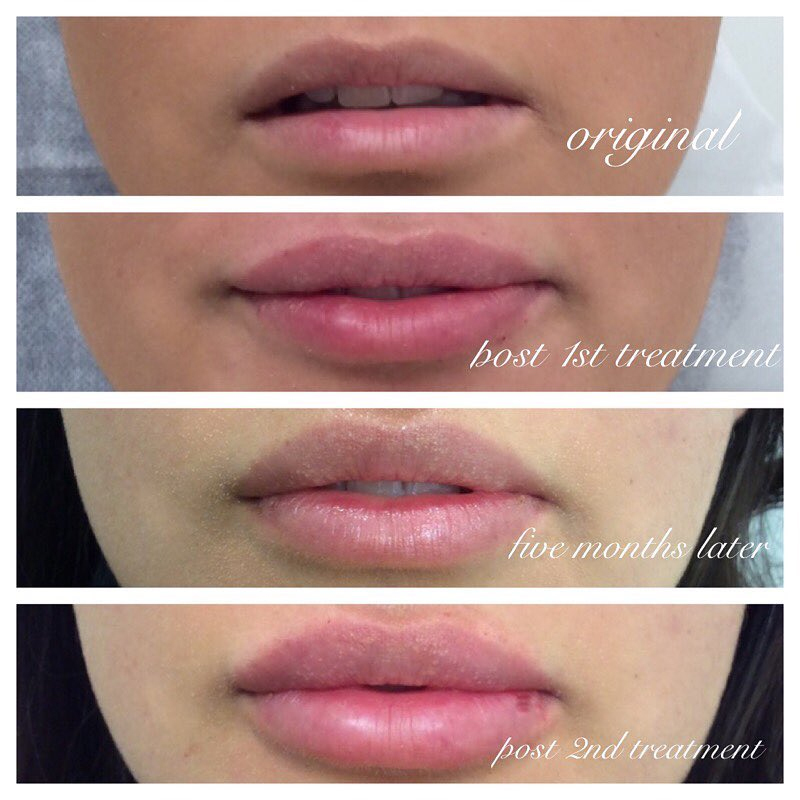 Side effects: Hyaluronic acid lip fillers have similar common side effects, such as swelling, redness, pain, headache, and itching at the injection site. With all these products, the side effects tend to resolve within a few weeks. Downtime: There is almost no downtime involved with dermal filler lip injections. The vast majority of people are able to resume their normal activities immediately after receiving their injections. While injectable lip fillers do share a number of similarities, there are also some subtle but important differences to be aware of. As the first dermal filler introduced to the U.S., Restylane has an excellent history of safety. It is a clear gel formulation that can be used to add general volume to the lips. Restylane and Restylane-L are made using the same formula. The only difference between the two products is that Restylane-L contains lidocaine, an anesthetic that helps reduce pain. Restylane and Restylane-L last for up to nine months. Restylane Silk uses a slightly different formula than Restylane and Restylane-L. It’s made using smaller hyaluronic acid particles, which enables it to deliver subtle and more natural looking results. It is commonly used to help smooth out wrinkles and fine lines that tend to develop on the lips with age. According to the FDA, the effects of Restylane Silk generally last for a minimum six months. Juvederm Ultra XC is widely used to reduce the appearance of facial wrinkles and folds, as well as increase lip fullness. It contains lidocaine to help reduce pain. Up to one year. Some studies have shown that the effects of Juvederm Ultra XC last nine months or longer in 75% of patients. Juvederm Volbella XC is primarily used to add definition to the lip line. It is formulated to reduce the appearance of perioral lines (the fine lines that develop on the lips as you age). Up to a year. Research published in Clinical, Cosmetic and Investigational Dermatology found that more than 80% of people were still satisfied with the results of Juvederm Volbella XC 12 months after treatment. With so many dermal fillers on the market, it can be difficult to know which one is right for you personally. Ultimately, the answer depends on your specific anatomy and unique cosmetic goals. Want to add subtle definition to your lips? Use Restylane Silk. Want to add general volume and fullness? Use Restylane, Restylane-L Injectable Gel or Juvederm Ultra XC. Want to treat fine lines on the lips? Use Juvederm Volbella XC. Concerned about pain? Look for products that contain lidocaine. Some studies have shown a 93% pain reduction in lip fillers containing lidocaine. Consider the above as strictly a rough guide. For more insight into your options, be sure to book a consultation with an experienced cosmetic provider. Overexposure to the sun’s UV rays can have an adverse effect both on your skin and the effects of your lip filler. Minimize sun damage by investing in quality sunscreen, wearing a hat whenever possible and avoiding direct sunlight during peak UV hours. Hydration is critical for the health of your skin cells and can enhance the effect of dermal fillers. Drink lots of water throughout the day and use a good moisturizer to keep your skin adequately hydrated. Stress releases cortisol, which accelerates the aging process and breaks down hyaluronic acid more quickly. Dermal fillers might be the most popular type of lip enhancement, but that doesn’t mean they’re your only option. A lip implant is a type of lip augmentation that involves inserting an implant into the lips to create the appearance of fuller, plumper lips. The implants are typically made from skin, tissue or saline. Unlike dermal fillers, a lip implant provides permanent (or very long-lasting) results. Over the long term can be more cost effective than fillers. Much more invasive procedure than lip filler injections, which means a longer recovery time and an increased risk of complications. Difficult to undo a lip implant. Possibility of serious side effects such as infection, implant shifting and lip asymmetry. A Botox lip flip is a non-surgical procedure that involves injecting Botox into the muscles that control the movement of your lips and mouth. This relaxes the muscles and allows the lips to flip outward, creating the appearance of more voluminous lips. Affordable. Botox lip flips are typically performed as part of a wider Botox treatment and can cost as little as $50-$120. Creates the illusion of shapelier lips but doesn’t actually add volume. Risk of impacting mouth functions. The cost varies depending on your location, your cosmetic goals and how much product your provider uses. As a general rule of thumb, you can expect to pay $500-$1,000 per treatment. The results of Juvederm lip filler injections are visible immediately after treatment. With Restylane, it usually takes a few days to see the full effects. They’re typically uncomfortable but not generally considered especially painful. If you’re worried about the pain, ask your provider about using a product that contains lidocaine. Can you reverse lip fillers? Yes. Hyaluronidase is used to dissolve hyaluronic acid fillers and works within minutes. No. There is almost no downtime involved with lip filler injections, so you can go back to your usual activities more or less immediately. Lip fillers temporarily add volume and smooth out fine lines to create smoother, more voluptuous lips. There are a number of FDA-approved products on the market that share many similarities in terms of procedure, side effects and recovery time. Selecting the appropriate dermal filler brand (or alternative treatment) depends heavily on your facial anatomy and unique cosmetic goals. There are many lip fillers that can be used to enhance the volume and shape of your lips. Every provider tends to have a brand that they prefer using, generally based on the extent of their professional experience with it. Your provider’s experience with a particular filler brand is the most relevant factor when it comes to choosing which is best for you. Book a consultation with a lip filler provider in your area to learn more about your options.